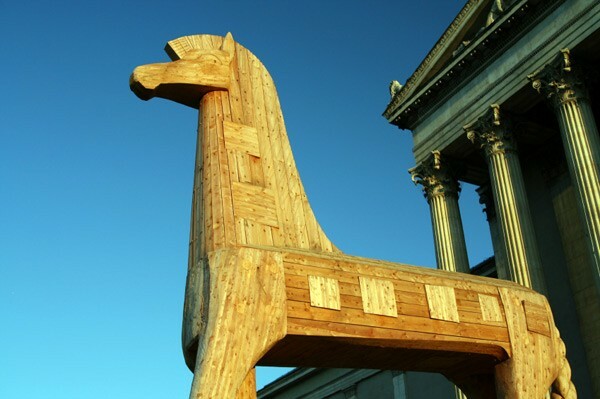 Lomita Ct. Stanford, CA — This past monday morning, the Kappa Alpha fraternity was formally presented with a colossal — perfectly innocuous — hollow wooden horse by Stanford’s new OCS executive administrator, Otis Ayus. In the context of Stanford Administration’s less-than-congenial relationship with Greek Life, some members in attendance of the ceremony were understandably suspicious of the administration’s intentions, citing a particular mythological tale. However, these voices of apprehension were outmatched by overwhelming gratitude for the clearly genuine, entirely harmless tribute. Tags: entirely harmless tribute hackneyed fable strategy highbrow allusions less-than-congenial relationship with Greek life wow look at that horse!